In took them a few years, but Y Combinator has finally stormed Manhattan. Albeit — much to the chagrin for some of the people reading this — for one night only. No, despite some of the rumors that had circulated around tonight’s YC NYC event, Y Combinator is not opening a branch in NYC. 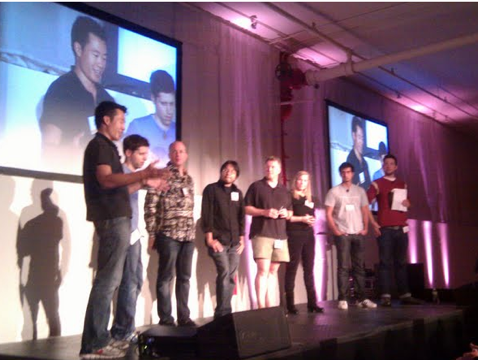 But the YC crew in attendance, which included nearly all of the firm’s partners and a dozen YC alumni, did share plenty of anecdotes and advice with a massive crowd of 800+ New York-based entrepreneurs, entrepreneurs-to-be, and an array of other people interested in the world of startups. The keynote of the evening featured a talk by Y Combinator cofounder Paul Graham, who tackled an issue that’s been pervasive in the NYC vs Silicon Valley debate: what are the key ingredients needed to foster a startup community, and does NYC have what it takes? Graham uttered that phrase many times during his talk, partly in jest, and partly because there are so many uncertain factors at play when it comes to determining whether NYC is a great place to build a startup. Graham kicked off his talk by trying to identify what fundamental things make a startup hub so well suited for building a company. “Startups fail by default,” he said, which is why launching one anywhere outside of a startup hub has such dismal results. But for some reason, certain areas (namely, Silicon Valley) have a sort of antidote that reduces this inherent likelihood of failure. But what is that antidote? In short, it’s Sean Parker (Graham referred to the incident when Facebook founder Mark Zuckerberg met Sean Parker on a sidewalk by chance — Parker later became Facebook’s founding President and played a key role in setting up the company’s equity structure). More generally, the antidote is a high concentration of smart, driven people who are interested in entrepreneurship and technology, and the likelihood of bumping into someone who can help you increases drastically. Graham then moved on to discuss the things that NYC has going for it. On the plus side, Graham says that the citizens of NYC have a greater desire to make money than those of any other city in the US — moreso even than their counterparts out in Silicon Valley. But there are some factors working against it. Silicon Valley, Graham says, is a sort of immovable force — it’s already very far ahead, and the only way NYC would be able to catch up with it would be for Silicon Valley to help it by starting to fail. And that isn’t happening — Graham says Silicon Valley is more of a startup hub than ever. Unlike most places in the country, it’s actually cool to have a startup in Silicon Valley (many people outside of the Bay Area tend to view entrepreneurs as if they’re currently unemployed). In the Valley, “they have learned to not default to skepticism”, Graham says. Graham also addressed the type of technology companies that seem to be emerging in both regions. Silicon Valley, he says, seems to be the hotbed for the ‘Platform’ companies — those services like Google and Facebook that can be worth hundreds of billions of dollars. Graham doesn’t see NYC as the launching pad for companies of this size, at least not yet. But he adds that perhaps NYC can be a place for companies that don’t need heavy technology behind them to flourish (and companies in some areas, like finance and fashion, may be better suited for NYC to boot). Graham’s conclusion: NYC isn’t about to overtake Silicon Valley any time soon, in large part because of the well-established financial sector there — but he still thinks NYC is a good place to start a company. He recalled a talk Ron Conway gave during a YC dinner last year, when Conway revealed that 20% of his investments were in NYC (that number used to be much smaller). The key to starting a successful company in NYC, Graham says, is to make sure you have connections with the Valley. One good way to do this is to get Ron Conway as an investor, but there are certainly other routes. These days, Y Combinator still insists that all companies participating in the program move out to Mountain View for three months. After the program, when a founder says they’re moving back to a city that isn’t exactly known for startups — Minneapolis, for example — Graham does his best to talk them out of it. But the ones that say they’re headed back to NYC? He doesn’t try to stop them.